1. Combine first 6 ingredients in a zip top plastic bag. Add shrimp to bag, seal and shake to coat. Marinate in refrigerator 30 minutes, turning bag occasionally. 2. Working with 1 rosemary sprig at a time, hold leafy end of sprig in 1 hand. Strip leaves off sprig with other hand, leaving ½ inch of leaves attached to leafy end of sprig. Repeat procedure with remaining rosemary sprigs to make 6 rosemary skewers. 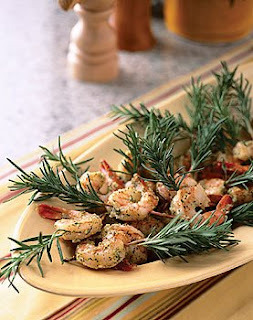 Thread 3 shrimp onto each rosemary skewer. 3. Heat a grill pan over medium high heat (or outdoor grill). Coat both sides of shrimp skewers with cooking spray. Arrange 3 skewers on pan; cook 2 minutes on each side or until shrimp are done. Remove from pan; keep warm. Repeat procedure with remaining skewers. Serve with lemon wedges for garnish if desired. Yields: 3 servings. Serving size: 6 shrimps per skewer. Nutritional Content: 208 Calories, fat 5.2g , 0g saturated fat, 34.7g protein, 2.4g carbohydrates, 0.1g fiber, 259g cholesterol, 4.mg Iron, 400mg sodium, 93mg calcium. Find more, great tasting, quick-fix, money and time saving recipes in my SOUPer Slim Diet eco-friendly ebook click here.